This playlist is a chronological collection of John Cage's works on Spotify. I only included one recording for every work, except for the Sonatas and Interludes, which I used recordings from eight artists, including dedicatee of this work, Maro Ajemian. Different versions of the works are also included, like In A Landscape played on harp and guitar, orchestra version of The Seasons, and Lou Harrison's arrangement of the Suite for Toy Piano. Nowth Upon Nacht (1984) is intended to be performed right after The Wonderful Widow of Eighteen Springs (1942) so I included the latter song twice. 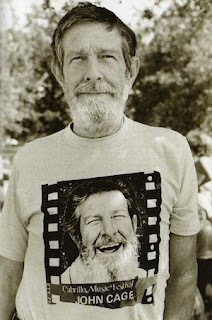 Here's the Spotify playlist: John Cage: A Chronological Collection (479 tracks from 100 albums, total time: 53 hours) Press Ctrl (CMD)+G to browse in album view. If you are new to Cage, try the String Quartet, Prelude For Meditation, In A Landscape and Sonatas and Interludes first. Then Four Walls, and the Number Pieces. Below is a list of works featured in the playlist, all linked to introductory articles on AllMusic, Wikipedia and John Cage Database. The playlist and post will be updated when more Cage recordings become available on Spotify.